Literally at the last minute, FOUR PAWS has succeeded in rescuing two young lions, Maria and Marian, from a terrible fate. The two beautiful big cats were just about to be transported and sold to a wildlife farm in South Africa. What the lions’ owners didn‘t know was that this farm offers wealthy tourists the opportunity to hunt lions bred in captivity! As horrifying as this is to you and I, Marian with his magnificent mane would have made an extremely desirable trophy to a heartless hunter. In order to save the two lions from this terrible fate, FOUR PAWS intervened immediately, informed the unsuspecting owners of what was really going on and thereby prevented the planned transfer at the last minute. But the lions could not stay at the African Safari Parc Zoologique near the French city of Toulouse. Their proud father saw the fully matured Marian in particular as a competitor and attacked both lions. So to prevent fatal injuries, Maria and Marian were initially moved to a small emergency enclosure. Now, to give the two lions a happier, more natural life, FOUR PAWS has brought them to LIONSROCK, where they will be able to live in peace and safety. So, with the wonderful help of people like you, Maria and Marian‘s story finds a happy ending after all under the South African sun. Rescuing animals in need costs a lot of money, not just for transporting them to new homes, but also for the many years of loving care and support that must follow. 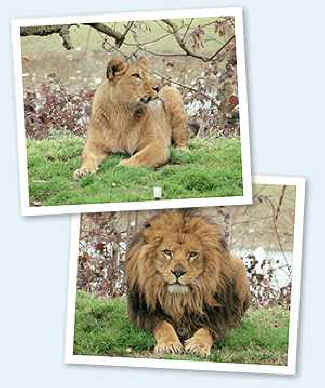 We need a total of EUR 14,000 just to transport the two young lions. And the cost of all the medical preparations for their relocation adds up to just under EUR 400.